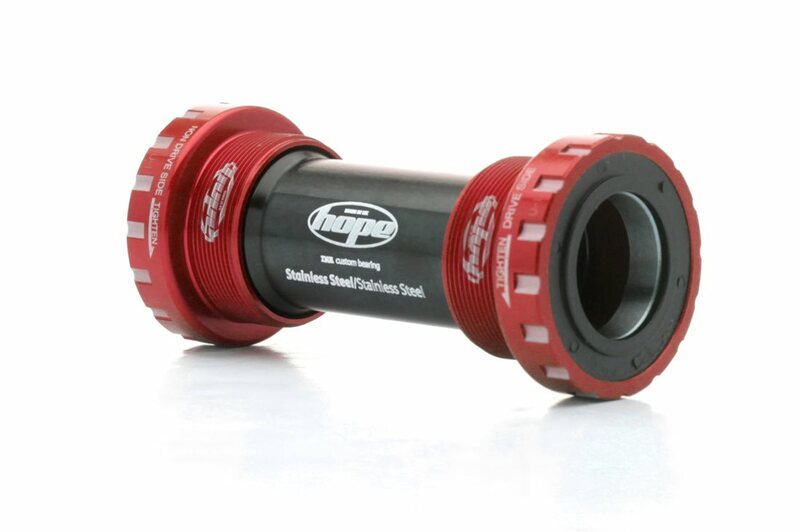 Keep your HollowTech II or Race Face X-type crank spinning smooth and fast by installing a Hope bottom bracket. Only the finest materials are use to create this amazing product, materials such as stainless steel bearings and cnc machined anodized alloy cups. the spindle actually rides on the bearings instead of on plastic like raceface. Even the spacers are aluminum. Very high quality. I bought this to replace the Shimano BB I was using with my XT cranks. The original had developed a creak after a few weeks. I replaced that one with another Shimano, and the noise returned a few weeks later. The Hope BB doesn't creak after 3 months of abuse. It even "feels" smoother, though I'm probably just imagining that. Love Hope's BBs. Not as pricey as CK but run just as smooth. The bearings are well sealed and stand up to wet weather riding nicely. Easy to install and they've always been very durable. Runs smooth, Looks great. Super easy to install. First time installing a bottom bracket, just watched a few videos got it done in less than an hour. Hope stuff is just awesome. You get what you pay for and there is a reason this BB is over 100 bucks. It spins smooth and it is built for the worst possible conditions. Hope is out of the UK and if you have ever seen what riding conditions are like there...you'll understand. I've been using Hope hubs and BB's for years and there have been instances where their spinning components have outlasted my bikes. If you frequently ride in sloppy conditions...Hope components are a must. Could not believe how much better this bb is than the shimano Xt hollow tech. Well worth the price when time to replace your stock bb. Delivery was on time. I have purchased from this vendor many times without any issues. Jenson has great customer service. I was in the Riverside, CA. store recently. Customer service did a great job again. Thanks Jenson. What I would expect from Hope! Perfection! Great 2-day free delivery from Jenson! Seems to spin more freely that a stock xtr bb. I have always just used Shimano bb;s just because there cheap and I can replace them once or twice a year with little expense, the latest versions of Shimano bbs seem to be a little stiff and have some resistance ,that is why I went with the hope, this time.the test of time will prove durability. I know HOPE makes good products so when I found out the make BB's, why not get a BB. What I like is can use reguler BB tool, no special tools like Chris King. What I don't like are no way to grease internal bearings like my Chris King. Did notice a creaking from BB from day one, will disassemble and re grease. Only time will tell if it last long. If wasn't on sale, probably would have just bought a CK BB. Ride on! My stock was Shimano Hollowtech BB (68 mm). I bought into the hype of smoother bearings with Hope; I didn't notice any real difference compared to my 5 year old Shimano which is still in use. The only difference is that you can service the Hope cartridge bearings with the appropriate tools (another ($40+) and the Shimano is labeled as non-serviceable, although some blog have indicated this can be attempted. I can't justify the 3 times higher cost of the Hope compared to Shimano. I will stick with Shimano. will this bb work w/ RACE FACE ATLAS CINCH CRANKS? BEST ANSWER: The Atlas Cinch Crank has a 30 mm spindle whereas this Hope BB is for cranks with a 24 mm spindle. For the Atlas Cinch you need to with with the Hope 30 mm BB which is the one that does not have the plastic centre tube. No. The Atlas cinch cranks have a 30mm spindle. You need a BB that can accommodate that. Hope does make one but for a hefty price tag. Raceface makes a BB30 that will work just fine and it’s pretty good and cheap. Which bottom bracket tool is compatible with this? Is park bbt9 compatible? BEST ANSWER: If the spindle diameter for this B.B. is 24mm than the park bbt9 will work. If you get the hope B.B. external cup with 30 mm spindle you will need the Hope tool. Will I need any adapters to use this with a Race Face Turbine Cinch crankset ? BEST ANSWER: Race face cinch has 30mm spindle diameter. Looks like that hope bb is for 24mm spindles so not gonna work. You need to get the hope 30 or another 30mm bb. Compatible with Race Face Ride cranks? Any adapter needed? BEST ANSWER: No adapter necessary per Hope's website. "All common systems are covered with this upgrade unit, making it ideal for Shimano, Race Face and Truvativ (extra conversion kit required)"
This is for a crankset with a 24mm spindle. Check the size of yours as I know some RF cranksets have a 30mm spindle. Will this fit the shimano ALIVIO FC-M 4060 CRANKS. ? BEST ANSWER: Short answer: yes. From what I can see from a quick Google Image search, this model crankset certainly appears to have the standard Shimano Hollowtech 24mm-diameter spindle - and why would they make one lower-end model with it's own, different spindle size... So, again, this BB will work with that crankset. This is assuming that your frame has either a 68 or 73mm-width BB shell, which it most likely does, and you can easily measure without any disassembly of anything. For 73mm, leave out the spacers; for 68mm, use one between the frame and each cup. I have a 1999 Norco team ti cross country frame with a triple chainring set-up, can I use the Hope cranks on my bike? thanks David,as i'm really wanting to get these cranks to replace the blah ones i have now. since everything seems to be aimed at 2x10,11 etc i wasnt sure my frame would be a fit . Does anyone know which aspect of this bb is ceramic and which is steel ball bearings I was thinking it was ceramic bearings with a steel ring that the bearings sit in if anyone knows more about the bearings and seals I would love to hear about it? BEST ANSWER: I would check out Hope's website but typically MTB bearings are hybrid ceramic with the balls being ceramic and the races being steel. I am pretty sure that is the case across the board so this BB would probably fall into that category. Is this bottom bracket compatible with the Shimano 11 speed m8000 crankset? 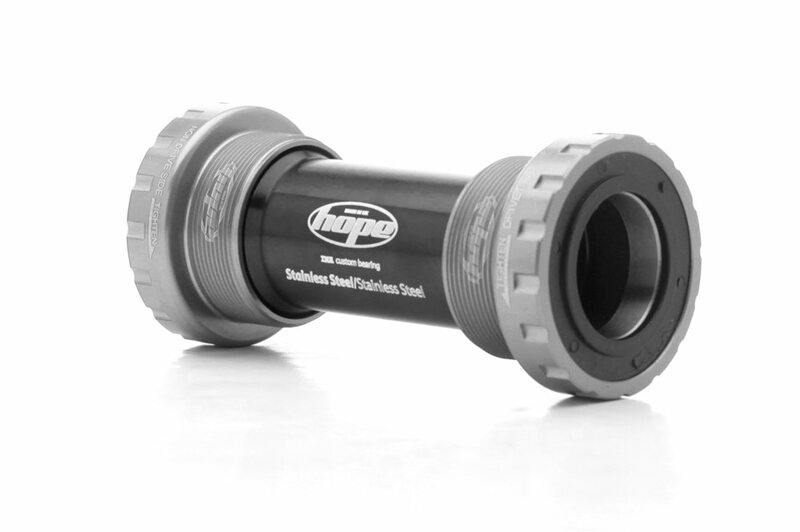 Yes, this bottom bracket will work with the Shimano XT M8000 Crankset, assuming that your frame takes a threaded 68/73mm bottom bracket. I have an FSA crankset with a 73mm BB. is this compatible?